One of my coworkers recently recommended Cafe Gitane to me. “You’ve got to get the avocado toast. It’s what I get every time I go there,” she raved. So, this morning, we arrived at Cafe Gitane in Nolita, just north of Prince Street on Mott, around 9:30 am. In preparation for our trip, I scoured the Internet for reviews and menus and general ideas about Cafe Gitane. It’s a French restaurant with Moroccan flavors infused in their dishes. Or, perhaps, it’s a Moroccan restaurant with remnants of French cooking. I can’t tell. And maybe the difference is small and insignificant. I noticed that their website only lists the two locations (the other is in the Jane Hotel, way west, in the West Village), with no hint at their hours, their menu, or their policy on credit cards, which varies from location to location. 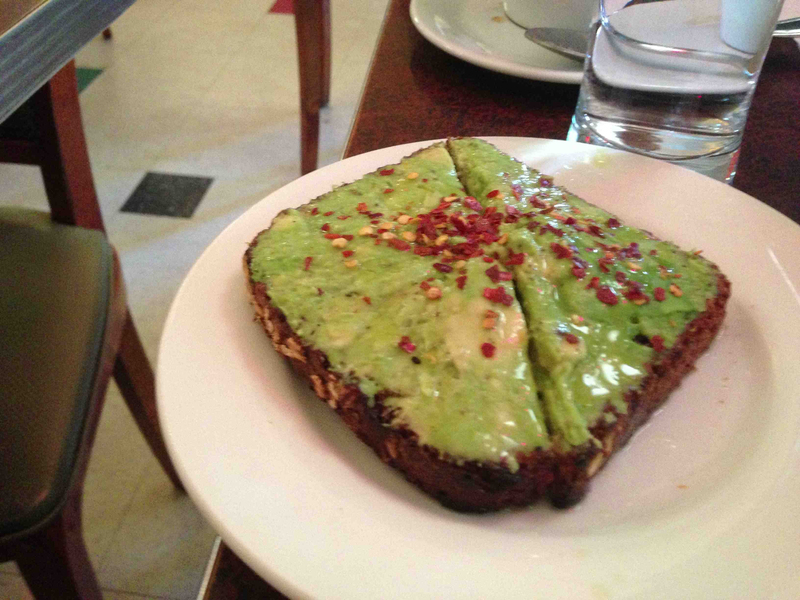 Yelp provided some insight into their menu, and reviewers lauded the avocado toast as the “must-get” dish at Cafe Gitane. So, with all this in mind, we trekked down to Nolita, ambled up to Cafe Gitane, and took a seat at one of about a dozen tables in the restaurant. A handful of tables line the simple exterior, providing prime people-watching positioning for patrons, while roughly six stools crowd around a clean counter inside. In the corner, a barista handles all the coffee–which is pretty expensive for a “cafe americano,” yet good–and two chefs man the counter, cooking and creating dishes as they chatter away the morning. When we walked in, The Smiths were playing over the speakers and, when we left, some remixed 50s tune filled my ears. The breakfast menu is limited. A few eggs dishes dot the menu, with a waffle and some pastries rounding it out. An indifferent waitress took our order. I opted for the baguette filled with baked eggs and merguez sausage, covered with shaved parmesan and chipotle mayo. To accompany the sandwich, they offered a side salad with a fruity (possibly apple) vinaigrette that alienated me. The sandwich itself was good, but I wasn’t blown away. While the eggs and sausage provided a nice flavor, the chipotle mayo was unevenly dressed, and so was the parmesan. I enjoyed the baguette, however, which was crusty and flavorful. MDP ordered the baked eggs with smoked salmon, potato, and cream, served to him in a quaint dish with three slices of baguette on the side. After allowing his dish to cool for several minutes, he chowed down and polished off the dish. It seemed like he greatly enjoyed his meal. And, of course, we got the avocado toast, which is something I will definitely make (better) at home. For $7, you’re really not getting a lot with this dish. Smooth avocado is smeared across the upper crust of a piece of multigrain toast. Roasted red pepper flakes are shaken onto the top of the avocado, with some (too much, really) lemon juice and olive oil forming a sheen layer that drips onto the plate and possibly down your sleeve if you’re not careful. It was definitely good, but, as I said, I can make this myself. 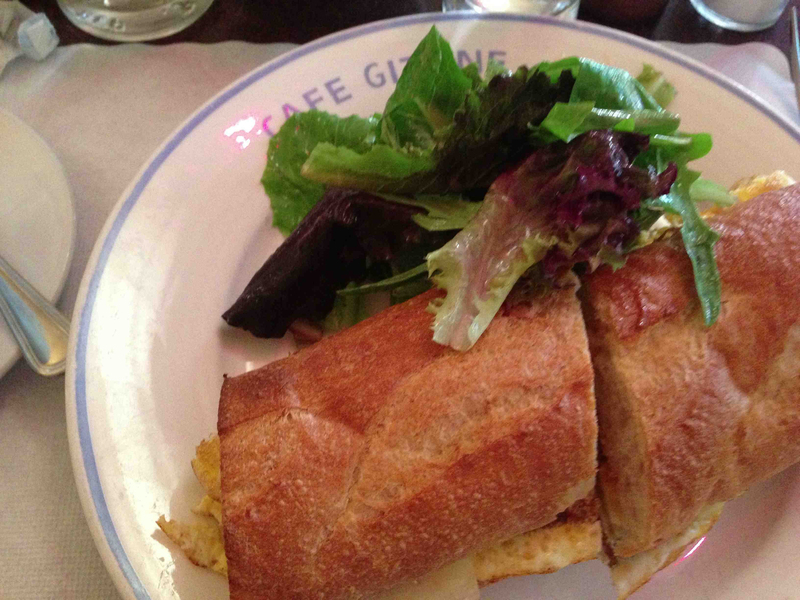 I like Cafe Gitane, but, as I told MDP, I’m not over the moon about it. I might recommend trying their couscous for dinner. If you go, remember to bring loads of cash, since Cafe Gitane in Nolita is cash-only. (And they prohibit cell phones, for what it’s worth). Take the N/R to Prince, walk east to Mott. 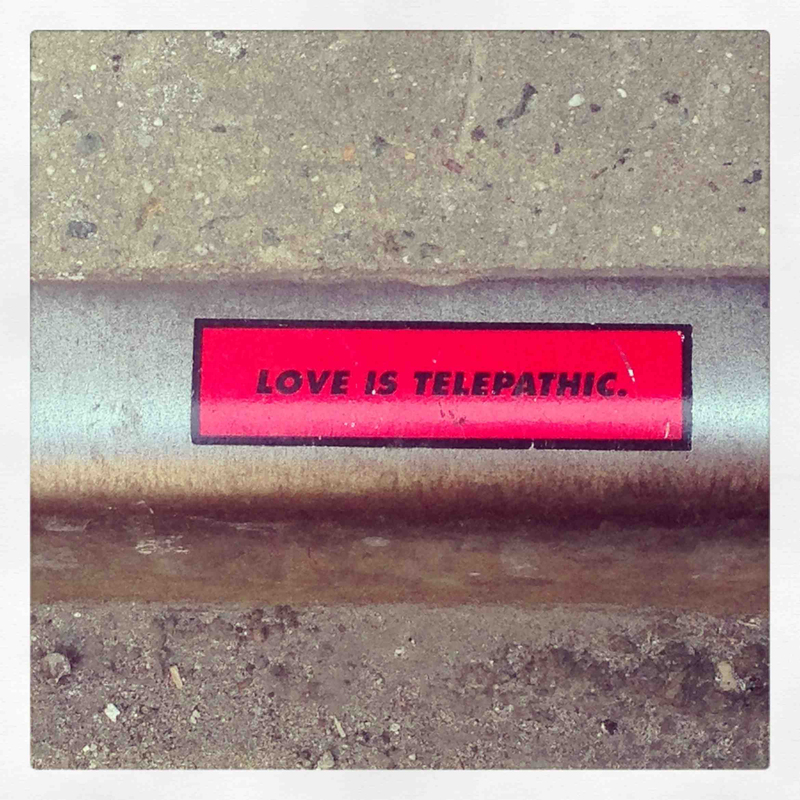 And, I’ll leave you with a bit of fun art from a sidewalk in SoHo. Whatever it means, it’s true.